Performance dips. Is it all just statistics? In the age-old debate about which works best – positively rewarding desired behaviours or punishing non-desired behaviours – we need to be careful that we don’t fall into the trap of making a causal attribution that does not actually exist. We may be observing nothing more than a mere consequence of statistical distribution known to students of statistics as ‘regression to the mean’. This is described in the excellent book Thinking, Fast and Slow by Daniel Kahneman (p 175), where he describes an Air Force trainer who objected to Kahneman making the claim that rewarding improved performance was more effective than punishing mistakes. His objection was based on his experience. When he positively praised someone for performing a manoeuvre well, on the next occasion the individual inevitably performed worse. On the other hand, when someone did badly, he would blast a condemnation into their ear which, in the view of the trainer, always caused an improvement in performance. 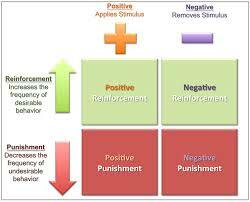 Ergo, negative reinforcement works more effectively than positive. And, so it might seem, on first inspection in this example. That is, until you think about these situations as being distributed levels of performance around a mean. It makes sense that one single piece of outstanding performance is very likely to be followed by one that is closer to the mean than before. Likewise, an extremely poorly executed manoeuvre is more than likely an aberration, and (even without the blast in the ear) is likely to result in an improvement, and a performance closer to the mean on the next occasion. What the trainer had stumbled upon was a rule of statistical distribution, and not a profound principle of psychological reinforcement theory. What we do know, however, is that the brain is wired in such a way as to be biased toward negativity. This is a consequence of our evolutionary journey and is one of the reasons that we have survived as a species. It was critical, and indeed life-saving at times, for our ancestors to be alert to danger, to be primed to detect predators, to see risks everywhere. Neuroscience demonstrates that our emotional centres are biased toward negative emotions, and, for this reason, positivity does face an uphill battle. It is working against the tide of our emotional make-up, and to overcome the bias (or at least redress it) we need to experience at least a 3 to 1 ratio of positive thoughts or experiences over negative ones on a daily basis. (for a deeper treatment of this area see the previous post Overcoming the Brain’s Negativity Bias). 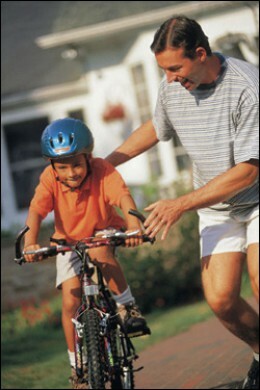 Negative reinforcements and punishments have their place in a world associated with danger and risk, but in a world where our safety is less of an issue, and the emphasis is on how well we thrive, grow and develop, the powerful effects of positive reinforcement are in the generation of optimism, creativity, empowerment and confidence. If you feel that you or members of your management team would benefit from exploring ways to make substantial improvements to personal and collective effectiveness and productivity, please do get in touch. Simply submit your contact details on the Contact Us page and I will be delighted to get in touch for an informal initial chat. About me: I enable people in business to operate more successfully. You may be struggling to implement corporate strategy, you may want to get more productivity out of your teams but don’t know where to start, or your people may not be having as effective conversations with each other as they could be. I will work with you to enable you to formulate more effective ways of leading, to raise awareness of blockers to successful ways of working, and ultimately to help you to lead more successfully.